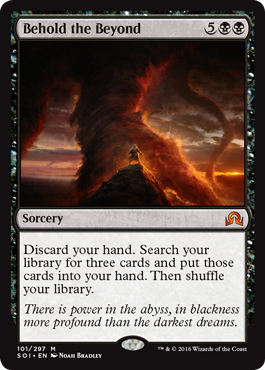 I have no delusions that this is vintage playable because of the CMC on the card, but the effect certainly is when you compare it to similar cards like doomsday. My question is not will this see play, but rather what would it have to have been costed to be viable? DD sees play at 3 black and half your life, but I think this would be FAR to strong at 3 CMC. 4 perhaps? Unless I am way off and this slides into some deck using omniscience? A tutor for 3 cards that you don't have to reveal? I couldn't imagine that being printed for less than 4BB. But consider lotus, tolarian academy, 4x dark ritual, 4x cabal ritual. I could see people trying it in DPS and wouldn't be surprised if it works as a 1 of. So often I see dps fill up 8 mana, then dark petition. You can do that, get this, get mana back and tutor up 3 spells. It is awfully expensive but tutoring for 3 cards - I wouldn't write it off so easily. Hey, it's another card to take note for that Mizzix's Mastery deck that doesn't exist. Right along Enter the Infinite and Praetor's Counsel. And well, there's always Rector/Omniscience. I wouldn't dismiss it that much if it's a game winning spell just like Yawgmoth's Bargain. Sure, but bargain is restricted. Griselbrand has taught us that there are decks that want more Bargains. Probably worth testing this. It can be as game ending as Bargain, but this isn't Bargain, guys. Bargain nets you card advantage, so your combo after resolving it is protected. This is Doomsday meets Ill Gotten Gains. You probably need a Pact of Negation in those 3 cards to protect it. For example, resolving a turn 1 Bargain can mean you just won the game. Resolving this... Well, we'll see how that game goes. This card is very powerful, but it's fairly cost. It's so close. lotus, yawg will, flusterstorm doesn't get you there after what? Assuming you cast this and still have at least 1 mana available for Flusterstorm, right? And even if you do, you may have to work with Lotus mana only after will. Also, in this case, Flusterstorm doesn't win a counter war against 2 counters. And if you pass the turn to untap, Flusterstorm gets way worse. I'm assuming by the time you cast this you have already cast a flurry of rituals (dark or cabal with threshold) and maybe a Gitaxian probe this knowing what they have and what to grab. The only way I see this working is if you cheat on costs, which is why omniscience seems like the only deck this makes sense in to me, also because you can chain them In that list. Omniscience into 2 duress effect into another one of these into more duress, eventually into wincon or whatever. But since Omnitell is really just a niche deck in vintage if at all, Not sure where this would fit. Maybe it would be nice to hit of minds desire or something? There is a real possibility that you already have played lotus if you can pay for this. I will be really surprised to see this played.